If you want to export a geoJSON of one of your GL JS Maps, you can go to the post you want to export, and press the “Import” tab. You will find a button there that will export your post, with all of the default properties and options that WP Mapbox GL JS Advanced adds to features in order to render them with your information. In order to export more than one map, or all of your maps together as one geoJSON, first you must go to “WP Mapbox > Mapbox GL JS Tools” on the left-hand sidebar of your WordPress admin. On this page, on the right hand side, you will see an Export Posts to geoJSON box. This export has a few warnings in it and will print all options that WP Mapbox GL JS Advanced creates automatically when making features. You will have to delete these manually if you want to remove them — or, send us an email if you need the ability to exclude certain properties from your export. You can choose a category or simply export all posts into a geoJSON. 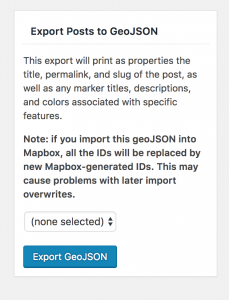 Note: please be aware that if you are using your geoJSON export in order to upload a dataset into Mapbox, the IDs will change when imported into Mapbox. This is a procedure done by Mapbox and we can’t force them to use the IDs we give to the features, even when they are imported from a dataset.